There simply aren’t enough professionals available to cover all the emergencies in a disaster. 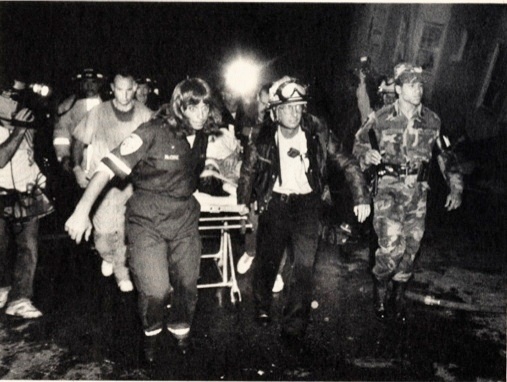 Volunteer rescuers in San Francisco’s Marina District on the night of the 1989 Loma Prieta earthquake outnumbered professionals three-to-one during the critical first few hours. And it still wasn’t enough. Only a small portion of the people present offered emergency help, despite the romanticized press to the contrary. Considering the amount of money and bureaucracy spent (well spent) on preparing the Bay Area’s buildings for earthquakes, it is startling to realize how little is spent on preparing people. 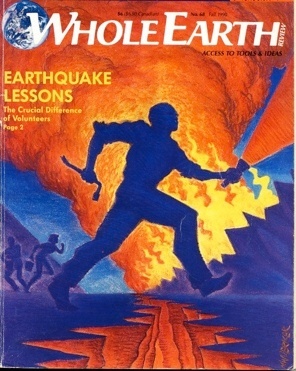 The widespread earthquake literature focuses on self-preservation, not on helping others, nor on the niceties of being helped. As a result, volunteer rescuers on October 17 had to make it up as they went—wasting vital time and making unnecessary mistakes. The city—and a watching world—were quick to praise the volunteers of that night, but no one has asked them what they learned, what they would do differently next time. The event was treated as drama, not as lesson. Especially valuable is the experience from the Marina, where—thanks to a fatal combination of bad apartment house design and shaky local geology—it was not the Pretty Big One that most people in the Bay Area experienced. In a few square blocks it was 1906 again, a foretaste of the Big One to come for all. I was lucky enough—I just happened to be driving by at 5:04 p.m. when the earthquake struck—to be a volunteer working at what turned out to be the signature event of the earthquake in San Francisco, the spectacular fire in collapsed apartment buildings at Beach and Divisadero streets in the Marina. A little before 6 p.m. on October 17 last year, I was approached by the first uniformed policeman I’d seen amid the earthquake rubble, smoke, and chaos at Divisadero and Beach in the Marina. “You’ll have to clear out,” he said firmly. “I’ve been working here for an hour,” I told him. He veered off. That reversal of authority was being played out, with varying degrees of grace, all over the area of northern California shaken by the 7.1 earthquake. Amateur rescuers on the scene acquired instant expertise. Professionals often proved to be poorly prepared for the scale of the disaster. Everyone was improvising. Like many, I found that I was haunted for days afterward by reflections on what I had done, and not done, and learned that night. None of those reflections were turning up in the press, though I suspected that nearly every participant in the rescue efforts had actions vividly in mind that they wish they and others had done better. With the aid of Phelps Dewey, Daniel Rosenheim, Karen Liberatore, and reporter John Aiello at The San Francisco Chronicle I was able to contact and talk to a number of the principle rescuers and rescued, to hear their versions and their critique of what happened. 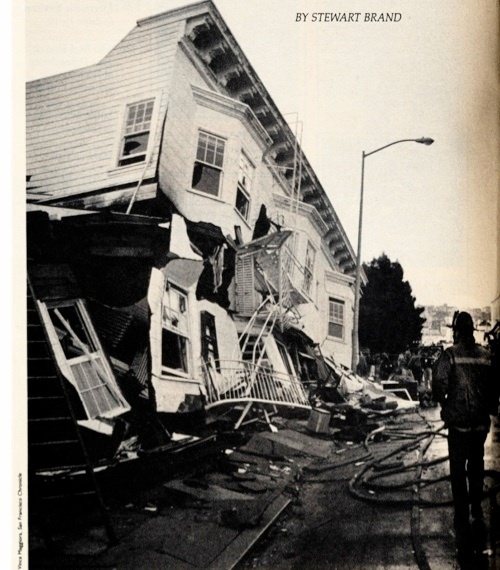 This article—which first appeared in much briefer form in the Chronicle—is an attempt to reconstruct the confused events of that first two hours at Divisadero and Beach, and to distill some advice that might be useful to anyone wishing to survive a disaster and to help others to do the same. The article is dedicated to Janet Ray, who did not survive October 17. Here’s what the alert good guy left behind in his car: a logger’s first aid kit, a flashlight, the new Army bayonet (designed mainly as a tool), a folding shovel, and Vibram-soled boots. Lesson one: collect thoughts, then collect tools! Arriving at the corner of Beach street I gazed like a tourist upon two four-story apartment buildings collapsed to one-and-a-half stories and tipped into the street—one on the east and one on the west side of Divisadero. The eastern one was shortly to become the most photographed building in the world that week. It was fascinating to contemplate. Inside it three women were trapped, but the origamied walls said nothing of that. Lesson: In any collapsed building, assume there are people trapped alive. Locate them, let them know everything will be done to get them out. When volunteer Brand first saw this former four-story building at 2090 Beach Street minutes after the earthquake, the scene was utterly tranquil, with no indication that three people were trapped inside. 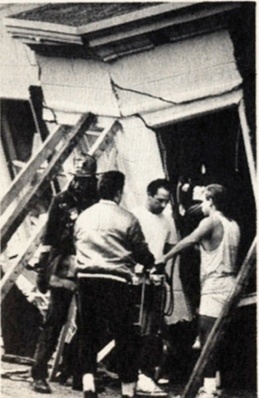 Sherra Cox was rescued hours later through the window to the left of the fire escape. In the front of the building I found off-duty police sergeant Dennis Gustafson doing the right thing, calling through the floor to two women who were buried, “What are your injuries? Are you bleeding badly? What sort of space are you in?” He and I proceeded to explore the building looking for an opening down to their level. There wasn’t one. I headed around the back of the building, clambering gingerly in my sneakers over the splintered, careened walls, amid a menacing stench of natural gas. Circling back to the front of the three-story building I saw young men lowering an old man down the fire escape of the collapsed four-story building across Divisadero. It was now two stories, also tipped into Beach Street, with its front wall peeled off, looking like a doll house. I saw smoke, just a little, coming out the top. Re-encountering Sergeant Gustafson, I asked him, “What about that smoke?” He shook his head, “That building’s gone.” I saw a rescue crew working at the far end of the building and realized where the prime urgency now was. Lesson: After an earthquake, further collapse is not the main danger. Fire is. Back to 5:04 p.m. In the four-story apartment building at 3701 Divisadero, William Ray, 33, was changing clothes in the bathroom of the apartment on the second floor, above the garage floor, on the west end. His wife Janet, 28, was in the living room overlooking Beach Street. When the earthquake began, they both headed to the hallway. There they embraced, and then their home shattered and embraced them. People were, but there were problems. Their building had collapsed to two floors, and those outside were afraid to go in the lower floor of such a severely damaged building. So the rescue crew of eight volunteers when I joined it was trying to tunnel a way in from the west side, but with almost nothing in the way of tools. I read later that one Bill McElroy spoke to a crowd of people gazing at the carnage on the Cypress Structure on Oakland, “We better get us organized. There’s people up there that need us. Go home and get ladders and some rope. Bring me some wire cutters, jacks, power saws, any tools you’ve got.” So far as I know, no one gave that vital speech in the Marina. I know that I did not. It could have done wonders, because all the garage doors of the neighborhood had been sprung open by the earthquake, and many of the renters of the tool-filled garages were standing nearby in the street. Collect tools! Finally we were joined by professionals. Fire Truck 16 had been guided to the scene not by phone or radio, but by people in the streets. Captain Bob Jabs sized up the appalling scene and immediately radioed for help, “We have two buildings collapsed, with people in both of them, and one of the buildings is on fire. I need an engine!” (A fire truck has no fire fighting capability, being equipped strictly for rescue. It’s the fire engines that have the pumps, hoses, and some on-board water.) Jabs split his meager crew—sending Howard Cross and Wayne Martin to the building where Sergeant Gustafson was to take charge of the rescue of the two women there, while he took Tom Bailon and John Reed across the street to our building with smoke puffing out of its eastern corner. Firefighter Tom Bailon changed the stalemated rescue situation with two quick moves. He called to the Rays, “Where were you when the building collapsed?” “In the hallway!” came the answer. With that information and his captain’s permission he led the way into the building, looking for the hallway of the floor above the collapsed floor. A few more shouts pinpointed the Rays’ location, and he and John Reed proceeded to chop down toward them with axes. Several volunteers joined them. I found a ladder that shortened the way into the building. Captain Jabs leaned out the window to call for tools from his fire truck. Of course it wasn’t as direct and purposeful as this brief account makes it seem. A real rescue is dreamy and hesitant, full of false starts and conflicting ideas, at times frantic and focussed, at times diffuse. It is a self-organizing process, neither quick nor tidy, but it proved to be effective all over the Marina that night. Another fire truck arrived—still not an engine. Firefighter Joe Conway from Truck 10 remembers, “When we rolled around the corner and saw all these buildings out in the middle of the street, I was just numb. There was people crying and freaking out all over the place. But then you just tuck it in, and we kicked in to what we do.” Truck 10’s Captain Bob Boudoures also divided his crew, sending Joe Conway and Jack Porter to help the men in the burning building, while he and two others started a second rescue at 2090 Beach, this one for Sherra Cox. The view from the street was frightening. One minute the fire started to flame up a little at the opposite end of the building from the rescue efforts, and the next minute the top floor was burning to the sky. A series of sharp explosions shocked the ears. Collapsed old wood buildings (pre-1945, when sheet rock walls came in) don’t burn like other buildings. Captain Jabs: “Wood lathe and plaster, when it collapses like that, all it makes is a big pile of kindling that’s fifty or sixty years dry.” With the walls gone, there was no protection to slow down the fire, and the fire was probably fed by natural gas, making an effective blow torch. The fire was spreading faster and hotter than anything the firemen had seen before. Bill and Janet Ray were still trapped in the other end of their collapsed apartment building at 3701 Divisadero when these flames broke out. Firefighters were beginning to get water, but it could not even slow the blaze in the old wood structure. On the right is the corner of the home of police sergeant Roger Battaglia, which also burned. Joe Conway was with Truck 10 in front of the fire. “It got so hot our truck started to melt—the plastic lenses melted, the glass broke. We jumped in and pulled the rig down further.” By now some fire engines had arrived and had tried one pressureless hydrant after another the length of Beach Street until they reached the Palace of Fine Arts lagoon three blocks away, where they threw in a hard suction line and began drafting, relaying from engine to engine to Truck 10’s line. Water! Kaplanis and I and other volunteers helped maneuver the heavy hose. But inside 3701 Divisadero the situation was deteriorating. The chain saw became useless when its blade broke on nails in the floor. Volunteers relayed in the “multi-purpose saw” from Truck 10—a heavy, gas-powered Homelite XL-98 that can cut through an axle with the right blade. The multi-purpose, after a delay getting it started, was put to work over where Janet Ray was pinned. 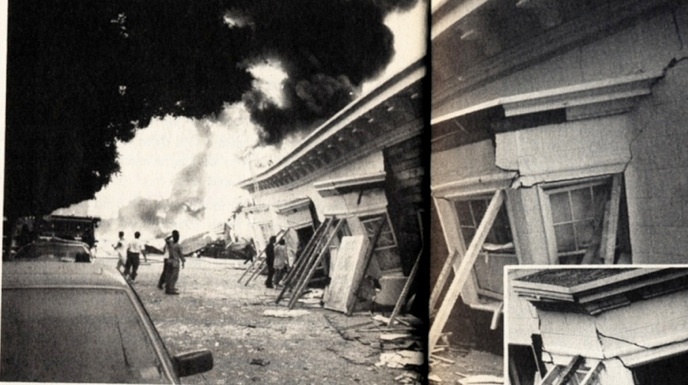 Tom Bailon tried to slow the approaching fire with a light inch-and-a-half hose with partial pressure—“I was trying to keep the fire from getting in the hallway where we were, but it was really hot and smoky. I did that as long as I could and then I had to get air, and John Reed relieved me on the fire.” Gasping out the window, Bailon saw that the floor above them was burning. Captain Jabs had ordered all volunteers out of the now-lethal building. The three firemen traded off on efforts to cut down directly to where Janet Ray was pinned. Jabs: “You’ve got to be careful when you start cutting away that you’re not cutting the support. I wouldn’t want to be cutting, thinking I was freeing somebody and then watch them get crushed in front of me. You’ve got to jack and shore.” When the explosions went off, the rescuers thought for a second the building was coming in on them. All Bill Ray knew was that the firemen were gone. And he was through remaining calm. “I told Janet, ‘I’m going to get free, and we’re both going to get free.’ I assumed that I was binding her and if I could get loose, then she could get loose. You just start pulling with everything you’ve got. You reach up and pull on the lathe and plaster and it’s breaking off in your hand. Then you’re grabbing a 2 by 12 joist and pulling. My wife was screaming because it was a lot of pain and her arms were trapped, and a picture frame of glass was cutting her. All of us who were there remember him standing in that window, gazing at our street full of chaos. He stood while we shouted for him to jump, then he tilted forward and slid head first ten feet down the slanting wall to a broken roof at street level. As we cheered, the nearest volunteer and Captain Jabs rushed forward to grab him and carried him free of the scorching heat to a group of medical volunteers. He was shouting, “Someone get my wife! Go back and get my wife!” A volunteer assured him, “Don’t worry, we’ll get her!” It was a lie. Flames were already coming out the window he had just left. As he was being carried in a sheet a block up the street to an ambulance, the blazing building collapsed into itself with a sudden, shocking finality. Everyone there absorbed a piece of the horror of it. We were crying, and then we were shifting attention to whatever had to be done next. Numb with the knowledge that Janet was dead, Bill Ray directed his ambulance to Pacific Presbyterian Medical Center. “The only time things started going right is when they got me there. That place was running like clockwork.” Next day he had extensive surgery for spiral multiple fractures of his leg, and he commenced his long grieving. Should we have told the Rays from the start that their building was on fire? If he had worked free earlier, it might have given the rescuers a better chance at freeing her. It’s a tough call, but I would now say yes, give people who are trapped all the information you’ve got, and enlist their help. Have them describe exactly where they are and what their situation is. Ask their advice. Tell them what you’re doing. Pass them tools and medical gear if you can. Treat them not as helpless victims but as an exceptionally motivated part of the rescue team. 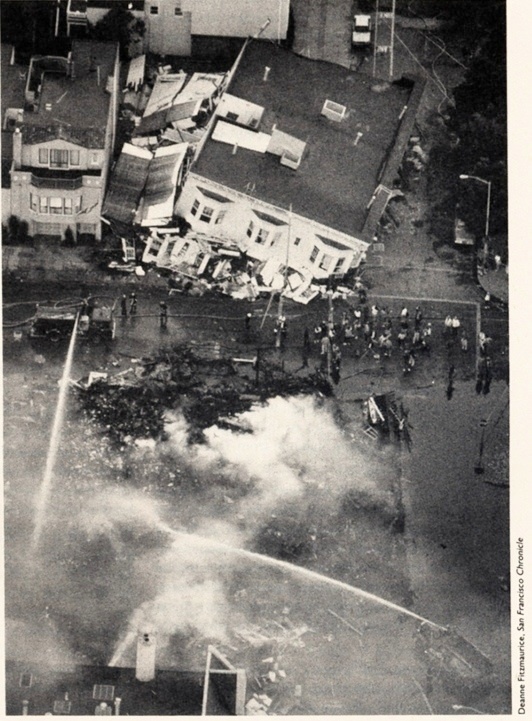 After Bill Ray left, the fire danger to the neighborhood was growing worse than ever, and other rescues were threatened in the collapsed building across Divisadero at 2090 Beach. If the fire wasn’t quickly contained, the growing conflagration would engulf the rest of the block and possibly that whole part of the city. The radiant heat of the fire was so intense that it was igniting buildings across both streets. Exposed cornices 50 feet from the fire would suddenly burst into flame. All the windows in the big apartment building across Beach from the fire shattered, and then exposed objects inside began to ignite. On the ground floor an open garage door started burning, with no hoses nearby. Two volunteers with buckets scooped up water from a gutter and dashed into the heat to put it out. Battalion Chief Gregory Abell, who had just arrived in civilian clothes, having driven from his home in Marin County, thought that the whole block at least was going to burn. By that time, about 6 p.m., Battalion Chief Vic Shannon had taken command of the scene at Beach and Divisadero and had called for San Francisco’s fire boat, the Phoenix. Abell took charge of coordinating the fire boat’s arrival. As soon as he got to the St. Francis Yacht Club docks, three blocks down Divisadero from the fire, Abell addressed a crowd of bystanders, “I’m from the fire department. The fire boat’s going to come in, and we’re going to have to get the hose off. I’m going to need volunteers. Just stand right here.” Immediately he had twenty-five volunteers. Some he sent to control traffic on Marina Boulevard, the rest he told what to expect when the fire boat came—how to help tie it to the docks, how to get the hose leads from the boat to the hose tender trucks that were arriving. Minutes after the Phoenix docked, 5-inch hose lines were being hand-pulled by a conga line of volunteers running up Divisadero (it made spectacular TV footage), and the fire boat’s 9,600 gallon/minute pumping capacity went into action, utilizing the new “portable hydrants” invented and built in San Francisco. Multiple lines began pouring a flood of sea water onto the fire which was now in four buildings. It was a minor quake, so only the Marina was seriously affected. Most of the professional and volunteer rescuers came from outside the neighborhood. If it had been a major quake most of those helpers would have been busy—or in trouble themselves—elsewhere. Joe Conway: “Usually we go to a fire and we’ve pretty much got a plan, and the chiefs are in control of the whole thing, and we’re with our captain, and he’s in control of us. We know what to do, but it’s all under supervision. Well, this thing was complete chaos.” Earthquakes will always be like that. How do you organize and communicate accordingly? The shortage of volunteers amid the gathering crowds was so easily cured. Lesson: If you want to lend your help, ask! If you want to be helped, ask! An earthquake is no place to be shy or diffident. At 5:04 p.m. on October 71 Police Sergeant Dennis Gustafson, 47, was off duty and headed home, waiting for a stop light at the edge of the Marina District when he watched a ripple come up the street and flip his Volkswagon van up onto the center divider. He remembers, “I turned onto Divisadero, and straight ahead of me I watched buildings collapse and the dust go up. I drove directly to that intersection, turned onto Beach, and jumped out of my vehicle. The whole facade of that building had dropped away; it was like looking into a kid’s doll house. And hanging out of the corner unit of what used to be the fourth floor was a bed with a little old gray-haired lady in it. “I got to the edge and realized that there was no way down. I told her, ‘I’m going to have to jump with you.’ It was about eight feet. I just jumped into the rubble and fortunately didn’t fall over anything, carried her over to my van, laid her on the edge of the sidewalk, took some blankets out, and propped her head up. “Another fellow then, tall and slender—six foot five, longer than average hair, mid-30s, calm demeanor, I never got his name—was climbing down with another injured woman from that building. He placed her in the same area and then he went straight back into that building. “I was the first official city person on the scene, and I kind of took over the intersection. I had no choice. It just happened.” Gustafson ran that pivotal intersection for the next six hours—coordinating people, directing vehicles, keeping an overview, being a reliable point of reference for everyone. Free-lance disaster management doesn’t come any better. The corner of Beach (left) and Divisadero (right). 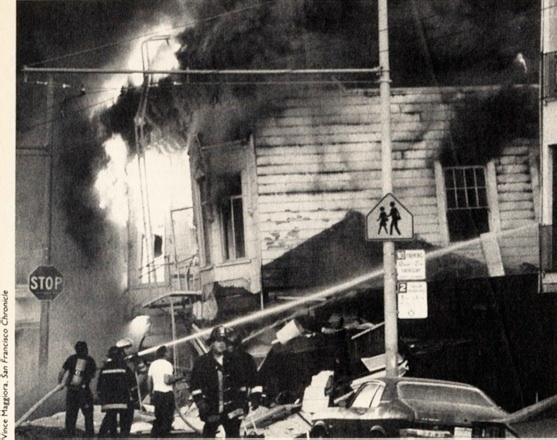 The Marina fire spread from 3701 Divisadero (center) to three other buildings and threatened the entire neighborhood. On the right wearing a tennis shirt is off-duty policeman Dennis Gustafson, the first city official on the scene, who coordinated rescue efforts. Schauffler worked part-time at San Francisco’s famed interactive museum, the Exploratorium, on the western border of the Marina District. At 5:04 p.m. he was inside a column of the massive rotunda of the Palace of Fine Arts. Suddenly the tiny windowless room shook violently and went totally black. He ducked under a counter as stored equipment fell around him, blocking his way to the exit. After fighting his way out of the base of the rotunda, he joined the half-dozen staffers at the museum entrance. Shortly they all headed toward the Marina, fanning out as each found a different emergency to work on. Because of shock and confusion, most action in a disaster is imitative. Most effective leadership is by example. Schauffler saw that the two were friends, discussing how to coordinate their search of the building—how far in should they go, should they keep yelling to each other? “Then I shouted to them, ‘Is there anyone in the next building?’ One guy says, ‘HOW WOULD I KNOW?’ I said, ‘Oh. Right.’” Right after an earthquake, nobody’s in charge. You self-start, or nothing happens. Schauffler went to the next partially crumpled building and talked some bystanders into going in with him. He took the second floor, shouting, “Hello! Anybody in there?” From the back came a voice, “Yes...” He found two women in their 80s. Eyeing the growing fire out their back window, he told them politely, “You need to leave the building. Get your coat, get your shoes on, grab your purse, and that’s it.” While they were doing that he made a sign for the door, “ALL OUT,” and hung it on the doorknob. Once outside, he suggested they go to the Marina Green, away from dangerous buildings. Jefferson Street was full of people, a few trying to help, most just standing around chatting or watching or in shock. Schauffler: “I noticed this one guy, in his late forties, who was talking to a number of the stunned older people by name—‘Hi Gladys, are you okay?’ He had a real presence—a big voice, a big guy in a red sweater, very gentle, kind of reassuring people and telling them to move down to the Marina Green. He was the only person like that I saw the whole time. Turning off gas led to uncertainty and a distress everywhere. Many people in the city turned it off when they didn’t need to and then had to wait days until PG&E could turn it back on. The rule is: if you can smell gas, turn it off. Otherwise leave it be. The whole Marina stank of gas. Many meter valves were inaccessible because of building damage, and San Francisco’s unique alternative valves in the sidewalk under concrete lids paid for themselves in one night. Elsewhere on Jefferson Street, Schauffler’s colleagues from the Exploratorium were having their own adventures. Rob Lytle, who used to work in construction, thought to bring a pry bar and hard hat with him. He recalls, “The second house that I came to that was damaged had a car that was stuck halfway out of the garage—the house had fallen on top of the car. An Asian woman was screaming next to it. I couldn’t understand her language, and that was the hardest part. I had a radio on, so I guess I looked like some sort of official. She grabbed me, and I saw her husband was trapped in the car, and a lot of debris was on him. “At this point I was like in a dream state, trying to rationalize that this has happened, I’m in the middle of it, and I have to react. I think that anybody that lives in this town should be trained in first aid. I thank the Red Cross for training me. I was prepared to do the first aid that I had to do. “When I finally got in the car, the guy’s nose was broken, his leg was broken, and he also had a broken arm. He had a compound fracture that was exposed, and he was bleeding. There was blood on my hands and shirt and pants. After I figured out his injuries and secured his legs I finally got him out of the car. I knew it wasn’t procedure, but I figured, just get him out of this car and out of this building. People were standing around in bewilderment. I was just so frustrated that nobody was helping when I was trying to get the guy out. “I put him in the street, and a paramedic came up. After that I kind of freaked I guess, because I was so worried about where my girlfriend was and all my other friends in the city. I felt like I had done something, but now it was time to take care of myself.” Many did it that way, and it was fine. It spread the help around. Bizarre stories abound. Another of the Exploratorium staffers, who I’ll call Bill (he’s modest), saw a man trying to get his car out of a garage with its door jammed. Bill started to help him, but the man just rammed his car through the door. A few doors further someone in the street said there was an old woman on the fourth floor who could not walk. Bill went up and found a woman with such severe osteoporosis she had broken her wrist frantically trying to dial 911 on the dead telephone. She had nine spinal fractures and was in extreme pain, but she was coherent and courteous. Bill went out for help. At the corner of Jefferson and Divisadero he found police officer Mike Moran. “Moran said, ‘Come with me. We’ll get her out now,’ Bill remembers. “He was great, very patient, really professional.” The old woman was amused when the men had trouble finding the right coat for her. They carried her in a chair carefully down four flights of stairs. Ten feet from the front door, two paramedics insisted on taking over. Bill realized why when the door opened to TV cameras and lights outside. Back at Sergeant Gustafson’s intersection the first two fire trucks had showed up, and two rescues were in progress in the building at 2090 Beach Street. It’s worth describing a little of how they proceeded because, though these rescues were carried out by professionals, in a larger disaster anyone might have to take on a similar rescue of a trapped family member, friend, or neighbor. An overview of Divisadero (horizontal) and Beach (vertical) the morning after the earthquake. At the bottom are the smoldering remains of 3701 Divisadero, where Bill and Janet Ray were trapped. Three women were in in 2090 Beach, the collapsed building at the top. The two women Sergeant Gustafson had heard under the front of the building were in their mid-20s. When Fire Truck 16 first arrived, Wayne Martin and Howard Cross were sent in to take charge of the rescue. Using Truck 16’s chain saw and multi-purpose saw they cut directly down next to where the women were buried. Howard Cross remembers, “They were so close to each other they were touching. They were in a lot of pain. They really didn’t know if they were going to come out alive or not. We always told them what we were going to do. When we were sawing near them, we put a blanket over them and told them to close their eyes. middle of Beach Street. Bill and Janet Ray’s apartment building burns in the background. trapped under the front of the building. The most delicate point came in cutting a heavy supporting beam off of one of the women without it collapsing on her. They braced it, cut one end, then were able to wedge in a bulky “jaws of life” tool to raise it a little, put blocks under it, and ease the young woman out. Both were put on stretchers and carried to waiting ambulances in the glare of TV lights. Referring to the ordeal of his colleagues across the street in the burning building where Bill and Janet Ray were trapped, Cross added perceptively, “I felt good about our rescue. Other guys like Tom and the captain, their rescue didn’t come out like the one I was involved in—they did have loss of life. There were a lot of guys where the rescue wasn’t as rewarding as mine.” It’s a sad truth that applause and awards and elation only go to successful rescuers, while unsuccessful ones have worked just as hard, against tougher obstacles, often in greater danger, with none of the release that goes with a happy ending. Maybe this is the point to talk about the psychological aftershocks that all rescuers encounter. I’m a fairly unemotional character, but I had four days of fierce mood swings following my experience in the Marina. I usually disparage Californians always wanting to share their damn feelings, but I appreciated it that week. Professionals nowadays have access to “Critical Incident Stress Debriefing;” amateurs make do with each other. All true, but you know what else? Ordinary life is flat after the intensity of a Critical Incident. We miss the drama. We’re not just upset, we’re bored. No sympathy is needed for that one. Every rescuer I talked to declared, with nearly identical phrasing, “We did the best we could under the circumstances.” Hidden inside was another statement—“The hell we did.” I think both are correct if employed right. Subjectively acknowledge that you did the best you could, then objectively question everything that happened and probe what can be learned from the mistakes. Be careful: if you get that backwards you’ll wallow in endless guilt and not learn a thing. The second set of rescuers at 2090 Beach was looking at formidable barriers. Sherra Cox, 55, who had moved to the building only two weeks before, was buried deep. She had two floors collapsed on top of her, and she was 30 feet in from the Divisadero side. With a dislocated hip and fractured pelvis, she was fighting to stay conscious. She could hear people’s voices, but they couldn’t hear her shouts; she had to beat rhythmically on a door with an iron pipe to get their attention. It was half an hour before anyone discovered her. Captain Bob Boudoures, from Truck 10, led the rescue. He and firefighter Jim Jenkins found a tiny crawl space that led 25 feet into the building, but they were forced back by overwhelming gas smell and hazard. After shutting off nearby gas valves, they re-entered and then were forced out again by fire danger from the blaze across the street. Not until there was sufficient water to protect the building could they go back in. At that time they were joined by fire fighter Gerry Shannon from Truck 9 and Duke Polizzi from Truck 2. Shannon went to the end of the crawl space, made voice contact with Sherra Cox, and there he, Polizzi, and Boudoures remained for the next two and a half hours. People outside thought the situation was hopeless and urged them to leave to avoid being buried under a second collapse, but they stayed, burning through two chain saws and using bolt cutters, axes, and a circular saw to get through the five feet of rubble between the crawl space and Cox. Sherra Cox was taken to a waiting ambulance by paramedics after a harrowing two-and-a-half-hour rescue effort. Equipment as well as courage was essential for the Cox rescue, and Boudoures has much to say on improvements that could be made. “I’ve recommended to the department—they asked for recommendations—that we purchase a few 3/4 ton pickup trucks and stock them with miner’s caps, ropes, and various other items for rescue. I worked in construction years ago, and I know what shoring basically is about. If you have a truck loaded with two-inch pipe in various sizes and screw-jacks with wide bearing plates, you can whip them in fast, they’re easy, they’re lightweight, and they’re secure. The big hydraulic jacks we had are unmanageable in confined areas; they’re back breakers. Training is as important as tools. Last year the State Fire Marshall’s office started to offer a four-day course in Urban Search and Rescue, giving exactly the skills needed for earthquake rescue operations. San Francisco fire fighters are beginning to take the course, but why couldn’t it be offered to Police Department people, to emergency medical technicians (EMTs) and paramedics, and to the general public, the same as First Aid classes? In a disaster the skills have to be where the emergencies are, because transportation often is completely blocked. Both Battaglia and Sergeant Gustafson had the problem of how to size up and assign volunteers that came up to them offering to help. Anybody coordinating volunteers has to ask, “What are your skills?” These are the best answers: medical skills (EMT, paramedic, nurse, doctor), group-leader experience (military veterans—especially sergeants, especially combat—also teachers, coaches, athletes, business team leaders, people who can organize other people), and, particularly, construction experience. Joe Kaplanis, the carpenter/contractor who helped with the rescue in the Rays’ building, observes that “in construction in general, you’re used to being in extreme situations sometimes. You’re used to tackling big problems.” Most of the problems in earthquake rescue are physical problems requiring handiness with tools, knowledge of materials, and a flair for inventive solutions with limited resources. 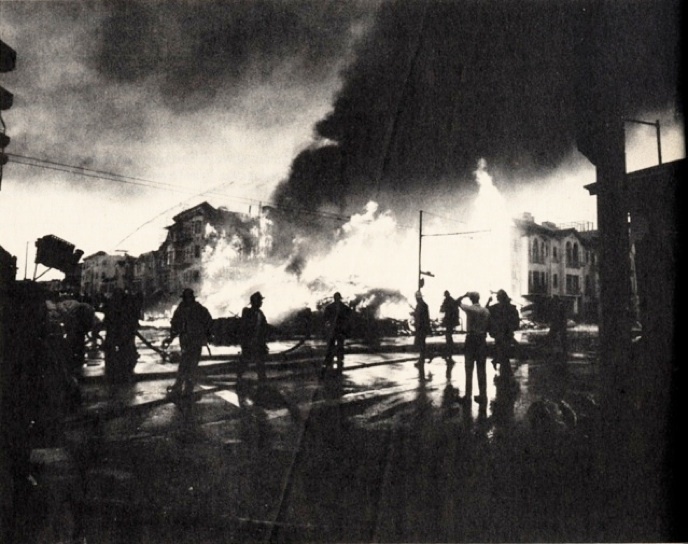 His adventures that evening continued when he walked up to Beach and Broderick, a block west from the fire, where the lack of water was making the arriving fire fighters frantic. “There was tons of equipment and no water. What was odd was the level of gawking and standing around in the middle of these guys really working their asses off. An ambulance would arrive, and people were so fixated on the fire they wouldn’t even get out of the way. I was yelling, ‘Get out of the street!’ Meanwhile two cops on little trail bikes were just sitting there talking to each other. They were totally useless. Shortly a fire officer had backed an engine down to the Palace of Fine Arts lagoon, next to Baker and Beach, and began drafting water to the fire. A policeman placed his car to block traffic from crossing the hoses from the north on Baker, and Schauffler appointed himself to block traffic from the south. Then he ran into Rick Girling, an old friend from his community organizing days, now a teacher at Galileo High School. “It was like, ‘Well, we’re a team.’ If you’ll go over to that cop and get some flares, and we’ll block off the street.” That’s what they did for the next three hours. From his post in the middle of the street Schauffler got an education in post-earthquake human behavior. Some people in cars would obligingly turn around. “Some would argue: ‘I own a house in there!’ We’d say, ‘Okay, but you need to park your car. You can park over by the Palace of Fine Arts and walk over.’ Then other people were very angry and would just try to drive over you. I discovered that flares are much more effective than a flashlight. People are more afraid of the flame. Volunteers are always uncertain whether they’re doing the right thing. They need encouragement—from professionals, from other volunteers, from passers-by. “At this point a big GMC van full of crazy Australians zooms up with a stack of aluminum police barricades strapped to the top. They yell in a thick Australian accent, ‘Hey mate! Need some of these?’ ‘Sure. Who are you?’ ‘Hey, it doesn’t matter!’ Then they started yelling at people in the park: ‘Help these guys!’ We were struggling to get the barricades down, and three people came over to help, out of fifty nearby. I saw it too. Bystanders make the convenient assumption that everything is being taken care of by the people already helping. That’s seldom accurate. Incidents like that occurred all over the Marina. There are vast quantities of free-floating wrath after a disaster. Much of it that night was directed at press, especially photographers. People would rage at them—and then go home later to see if their picture was on television or in the newspapers. I had exactly that reaction myself, and I used to be a photojournalist. I can’t explain it. There was so much potential help in the Marina that was dissipated in lone tentative actions or simply never invited to help. Lesson: Join a team or start a team. Divide up the tasks. Help leadership emerge. Rescue work is so real it takes your breath away. Do it once and you get hooked. The bonds you form with other rescuers and with the people you rescue, even if you never learn their names, are something you’ll cherish. Whatever you do in a disaster situation you will later ponder at length, with pride or with dismay, depending on what you attempted. If you worked hard to help other people, that vivid memory and the sharpened sense of yourself lasts a lifetime. • Right after an earthquake, nobody’s in charge. You self-start, or nothing happens. • If you can smell gas, turn it off. • After an earthquake, further building collapse is not the main danger. Fire is. • When you see a fire starting, do ANYTHING to stop it, right now. • In any collapsed building, assume there are people trapped alive. Locate them, let them know everything will be done to get them out. • Give people who are trapped all the information you’ve got, and enlist their help. Treat them not as helpless victims but as an exceptionally motivated part of the rescue team. • Join a team or start a team. Divide up the tasks. Encourage leadership to emerge. • Most action in a disaster is imitative. Most effective leadership is by example. • Bystanders make the convenient assumption that everything is being taken care of by the people already helping. That’s seldom accurate. • If you want to lend your help, ask! If you want to be helped, ask! • Volunteers are always uncertain whether they’re doing the right thing. They need encouragement—from professionals, from other volunteers, from passers-by.